CLASSICAL VOCAL ARTS FOR CHILDREN brings children of all ages and musical ability together in a nurturing and inclusive environment where they learn to sing and appreciate music while they develop self-confidence, build relationships, strive for excellence, and gain respect for one another. NYC performing artist Cheryl Warfield presents “Classical Vocal Arts for Children" (CVAC), a music appreciation and chorus training program open to all students aged 8-14. CVAC provides participants the opportunity to explore vocal music and expand musical skills through vocal technique, ear training, language arts, and performance of vocal classics and opera. CVAC is presented on Manhattan's Upper West Side in collaboration with Performing Arts Saturdays! at the Bernie Wohl Community Center, 647 Columbus Avenue, New York, NY 10024. For more information contact Susan Macaluso – 212-799-9400, ext. 205 or smacaluso@goddard.org. Prospective participants may sign up to join anytime by attending a rehearsal. A requisite number of rehearsals must be attended to participate in performances. Vocally proficient participants may be invited to join MORE Opera children’s chorus (www.moreopera.com). 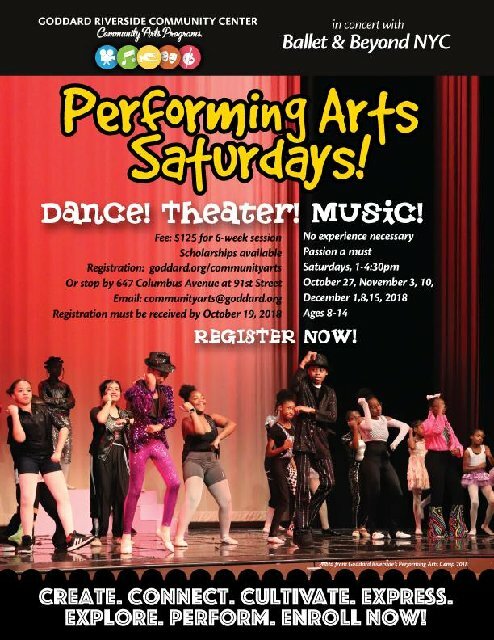 All participants are expected to exhibit exemplary behavior and attendance as part of their commitment to their ongoing performing arts education.